There are dozens of records that have been landmarks for this scene over the past decades, but precious few standout as true monuments to a time, place and movement. 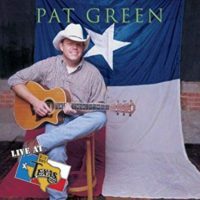 One such record is Pat Green’s Live at Billy Bob’s effort. Originally recorded on December 4, 1998, and celebrated this past Saturday night as the crowning achievement it is, it was a transcendent collection for a burgeoning scene and business. Billy Bob’s Texas had cache in 1998, but it wasn’t what all it would become until Rick Smith tapped Pat Green and Merle Haggard to record live records in the famed honky-tonk. The same could be said for the former artist himself. Pat Green was defying labels, borders, expectations, and traditional models as the PG buzz moved from underground to regional. The Gruene Hall live effort, Here We Go, stands as a more authentic representation of the time, but it was the Billy Bob’s set that vaulted PG into trucks and barrooms across the Lone Star State. Rick Smith’s gamble would turn into a goldmine. It would transform Billy Bob’s from an oversized corny corporate venue into a brother to its sister Gruene Hall. More Opryland than Grand Ol’ Opry but just as essential. Getting booked at Billy Bob’s would become a benchmark that all artists worth their salt would set as a goal. Being asked to record a live record at Billy Bob’s became a pinnacle. Pat’s effort would leave breadcrumbs for artists to try and find over the next 20 years. Amped up crowd noise added in post production, slicking up the rough edges, letting a killer top flight band fly into mini-jams and nailing their parts, genuinely engaging the crowd and leaving both the audience there on 12-4-98 wanting more, along with all those who have listened to it since. It was a genius formula. Oh, and you might want to throw in a new song that will soon become one of your calling cards, “Take Me Out To a Dancehall”. As the 20th anniversary approached, things had changed a little. The music industry doesn’t look quite the same as it did all those years ago. Pat Green is no longer a young upstart with a rabid underground following and Billy Bob’s Texas has now released over 40 Live at Billy Bob’s Texas albums. The ones from Cross Canadian Ragweed, Jason Boland and the Stragglers, Randy Rogers Band, Stoney LaRue and Wade Bowen each delivering the same kind of next level bump and confirmation that resulted from Green’s. I wasn’t there that night in December twenty years ago, but I was there plenty of nights around that time and many nights since. The Pat Green that took the stage Saturday night to commemorate all that he’s accomplished since that fateful night had more in common with the ’98 version than I’ve seen in quite some time. Pat was jovial, excited, engaged and he even gave a nod to the first recording by starting the night with his fantastic cover of Joe Ely’s “Me and Billy the Kid”. The band was not the same (it would have been cool to see Danaher, Anthony et al at least for a few songs), the vibe was not the same and the crowd was a bit more tame than those of back in the day. But, when the big Gibson Hummingbird echoes the chords of “Songs About Texas” throughout the cavernous hall, it is easy to be transformed and transported back to that place. It was a special night for a special moment. It’s interesting to see our scene start to look back on itself this far down the road. We’ve lost some along the way, yet as a whole we are still chugging along. Ebbs and flows, ups and downs, sell outs and empty nights. It’s all part of the ride. A ride that wouldn’t be taking place without the whim of Rick Smith in 1998 and Pat Green’s charismatic ability to be both showman/songwriter and marketer. They laid a framework that just about everyone has built a house on since. Those that don’t study history are doomed to repeat it…yet sometimes it’s worth repeating. Saturday night was an example of that. Pat Green reminded everyone of how and why he became the King of Texas Country. A moniker and crown that hasn’t always been easy for him to wear, understandably. But, it is one that is starting to feel a little more comfortable these days. That’s good news for everyone. I’m still here and so is Pat Green.